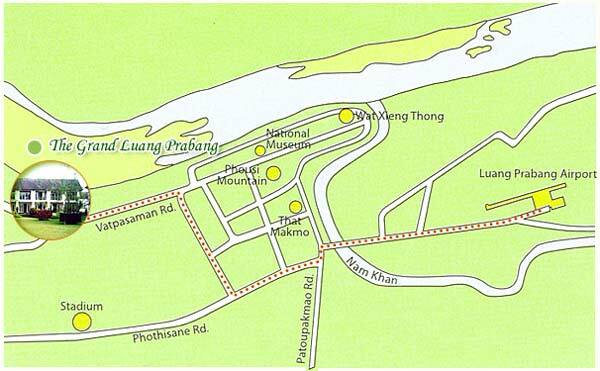 The Grand Luang Prabang is located 3 kilometers/10 minutes from town center and 6 kilometers/15-20 minutes from Luang Prabang Airport (City speed limit: 30 km/hr). 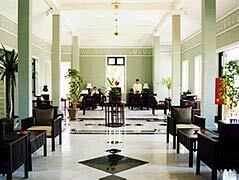 To visit the town center our hotel has free shuttle van service for the guests. 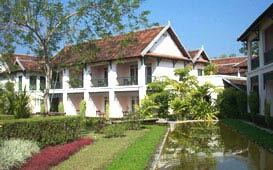 Grand Luang Prabang hotel and resort is on the ground of the Xiengkeo Palace which belonged to the famous nationalist hero of Luang Prabang, Prince Phetsarath. 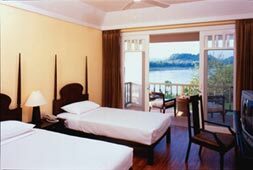 He chose this site for tranquility, stunning views of the mighty Mekong River, and the breathtaking landscape of mountains surrounding Luang Prabang. Le Bistrot: Bar and lounge in the center of the hotel complex. Features include live music and karaoke. Open hours: 5.00 pm - 11.30 pm. Seating Capacity: 60 persons. The Sunset Bar: The Sunset bar is named after the spectacular sunsets over the Mekong River. Opening hours: 11.00 am - 7.00 pm. Seating capacity: 30 persons. Room Service: Available 24 hours a day with special menus prepared for our guests and placed in each room. Conferences and banqueting facilities: Facilities include the Business Center two meeting rooms furnished with state of the art equipment. Capacities range from 12 to 120 people depending on function arrangemen. Business Center: A full range of facilities and state of the art equipment and services are available at the Business Center. Comfort is the key factor in our riverfront Suite with a leisure concept. Located at the ground floor in the beautiful garden overlook a panoramic view of the Mekong River through large floor-to-ceiling windows throughout with walkout balcony. Spacious living room has the right atmosphere for relaxation. 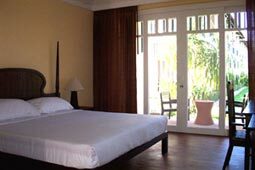 Mekong Suite has two bathrooms, one with separate bathtub and walk in shower. 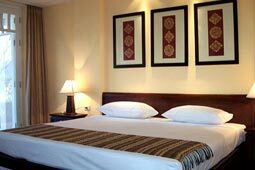 King-sized bed or twin beds are also available. 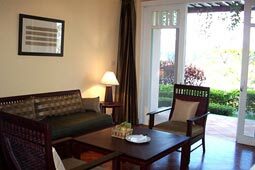 Kitchen area with microwave, coffee set, utensils, and refrigerator are ready for self-catering light meal. IDD telephone, individual thermostatic controller for air-conditioning, remote control colour TV and a choice of international satellite programmes, mini bar, hair dryer, bathrobes, slippers, daily amenities, fresh flowers, and fresh fruits. Work area with stationary is also provided.